I have been begging Christina of Wardrobe By Me for months to deliver a fitted blazer to her adoring seamstresses- she very understandably told me that blazers are hard and I need to chill out 😀 Blazers are complicated to pattern, difficult to provide instructions, and challenging to fit for a wide range of individuals. With the testing and release of the Amelia Bomber Jacket and Classic Coat, we’ve been slowly working towards being confident & motivated enough to tackle a project of this scale. Now that I have mastered welt pockets, notched collars, two-piece sleeves, and a bagged lining I feel like I can take on just about anything! Join the Facebook group for an additional discount for 24 hours! Fabrics Stable knit fabric with some stretch that can withstand vigorous pressing. 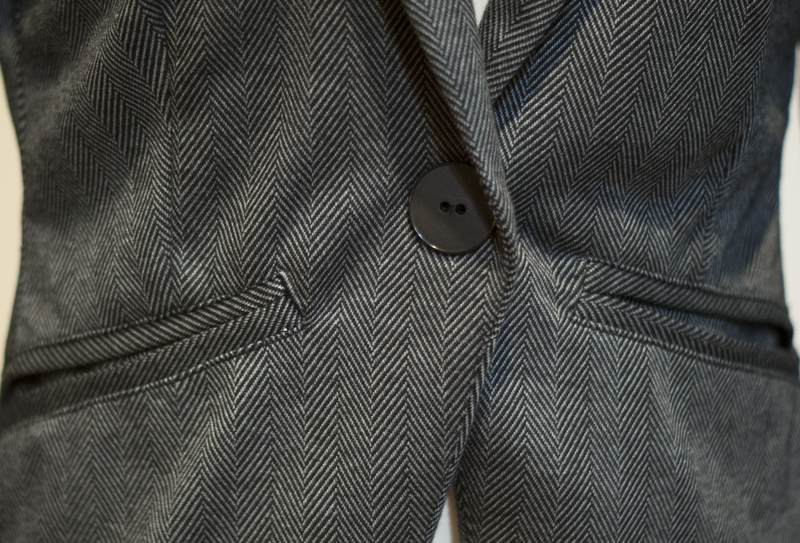 One of the testers used stretch denim, so stretch wovens are fair game- just be aware that the seam allowance is 3/8″. Lining should have some stretch, be thin and slippery. 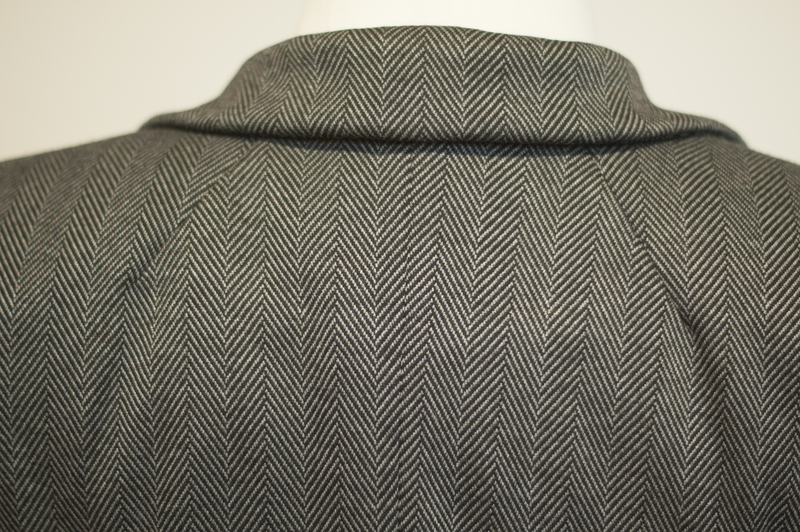 I used brushed herringbone double knit from Michael Levines (sold out, sorry! ), and a stretch chiffon from the Nicole Miller line at Joanns for the lining (hooray red tag clearance!). I’ve worn this to work twice already and it is very comfortable and professional. It slides right in to my work wardrobe and will be a staple for a long, long time. During testing I made minimal adjustments for personal fit (just some length removed above and below the waist, and at the top and bottom of the sleeve). Now that I have worn it, and I’m comfortable with the construction and finishing, I feel ready to tackle some more individualized fit adjustments: remove some fullness from the sleeves, grade out just a tiny bit at the waist, bring in the area just above my bust just a smidge. These are fairly common adjustments for a petite stature, and I’m thrilled to have a wonderful base pattern to start with. This is an advanced sew- between assembling and adjusting the pattern pieces, cutting and interfacing the fabric, and actual construction, this was about a 20 hour investment for me. I recommend pacing yourself, taking regular breaks, and quitting each day while you’re ahead. The pattern instructions include frequent reminders to press as you go, and this is vitally important to getting the best possible result. If you’re feeling intimidated, don’t be! Christina will be hosting a sewalong, documented at Wardrobe By Me, so you can follow along for help at any time. Make sure you join the facebook group as well – Christina is enormously helpful with answering questions about fabric, fit, and construction. I have enough of this herringbone fabric left over to make a matching Haute Skinny Skirt, some gorgeous modal knit to make a coordinating Daisy Drop Shoulder tee, and a whole pile of stretch suitings to make full matching suits including Haute Skinnies and Flat Front Slim Fits (all aff links). Now that Me-Made May is right around the corner, I can’t wait to get a solid start on revamping this part of my wardrobe. I’m so proud of my collar! Double-welt pockets that I didn’t get *quite* right with the top-stitching, but I’m ready for my next set to be amazing. I hand-stitched the ends of the pockets closed for about 1/2″ to help keep them from pulling – the natural weight and curves has them draping a bit (the pockets are faced) and I wanted to keep them together just a little extra. 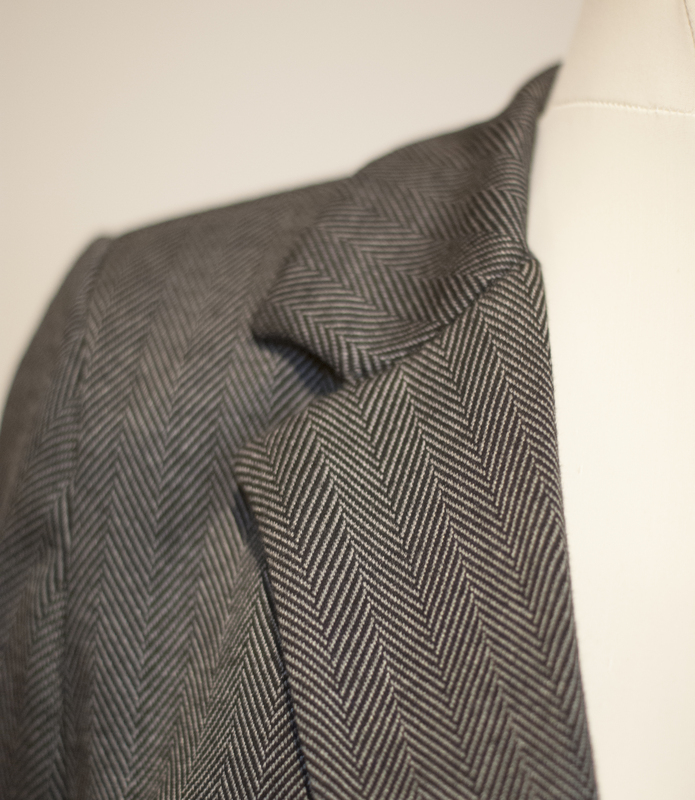 I fell in love with shoulder darts while making the Classic Coat – the detail is repeated here and it makes for such a nice fit! I almost forgot that I promised my friends in the Capsule Wardrobe Sewalong group an extra tutorial on sewing darts without having to make any marks! Sorry some of the pictures are a little blurry- that’s what happens when I sew late at night. Last step because I ran out of space: Anchor your stitching just beyond your snips, then loop your long top thread around your end mark pin. Follow that thread line to stitch your dart. Make your stitches shorter as you approach the fold and tie your ends when you run off the edge.